Back to my roots today - my love of Japanese reproduction fabric. 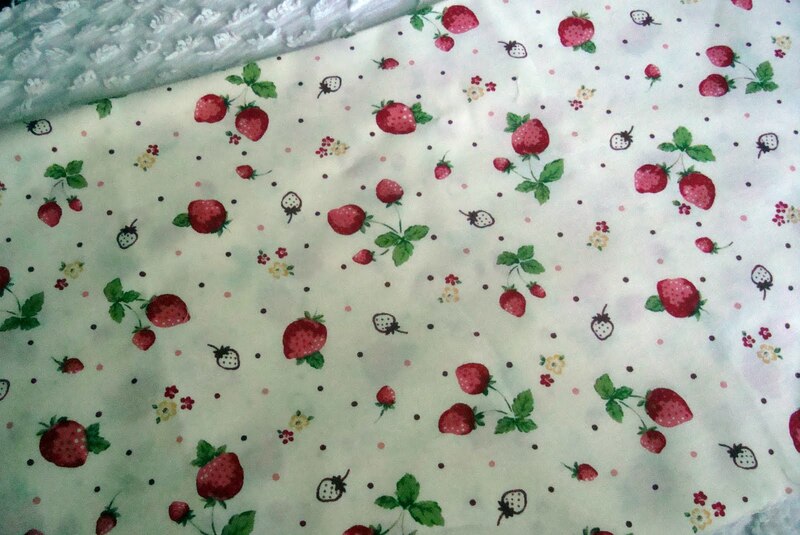 I love strawberries in fabric. 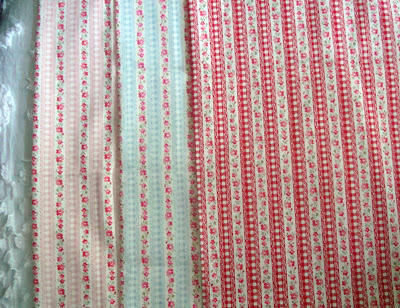 This fabric above in 2 colorways is from a line called Very Cotton. It is sweet dotted fabric with ribbons intersecting. Very unique and pretty I think. 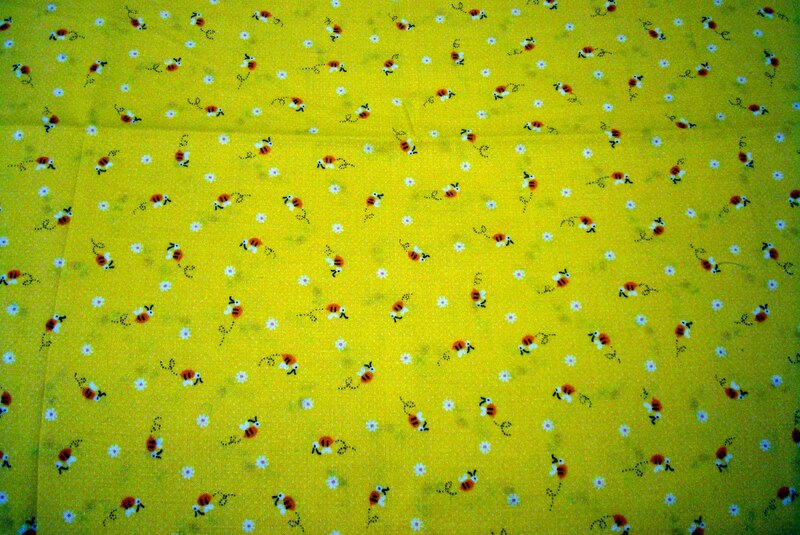 This is another fabric from that same line of Very Cotton. The strawberries are very sweet. 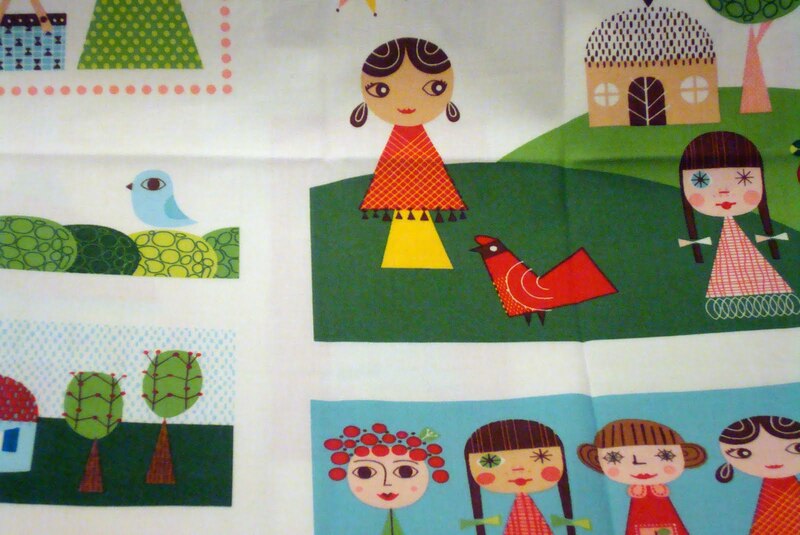 This fabric I posted upside down, oh well, is retro kitchen items by Cosmo. I like it in both colorways. 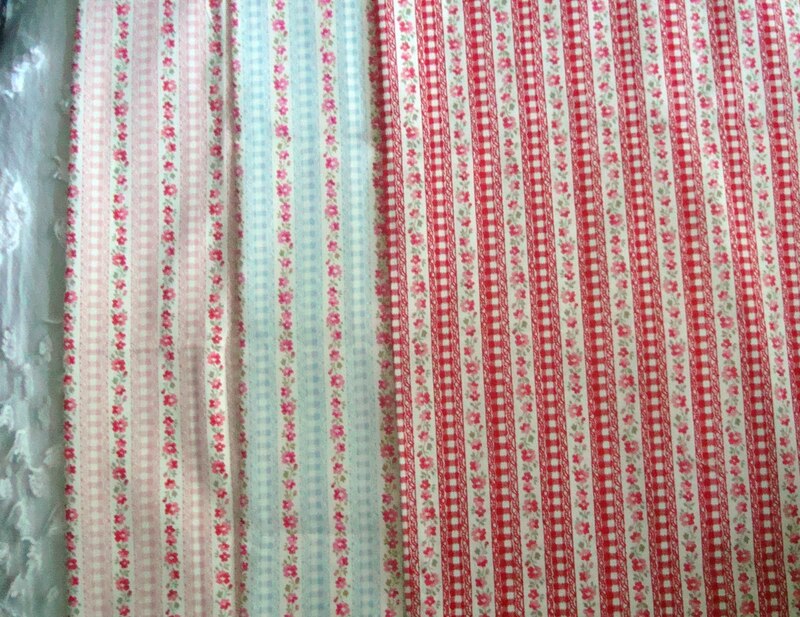 If I find a bit of fabric I like very much, then it is that much better in 2 colorways. This little rose stripe I found in 3 colorways. I love all the colors, too. This line is called Sevenberry. 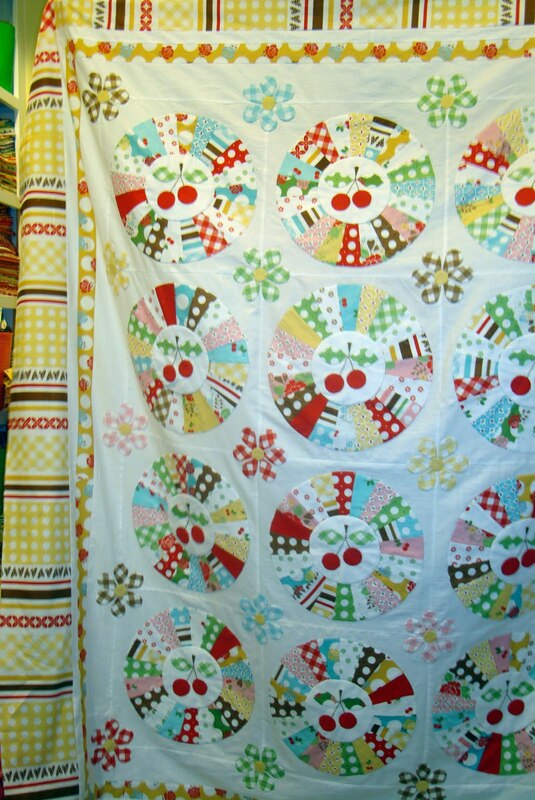 I've used this little baby matryoshka face fabric in several projects. 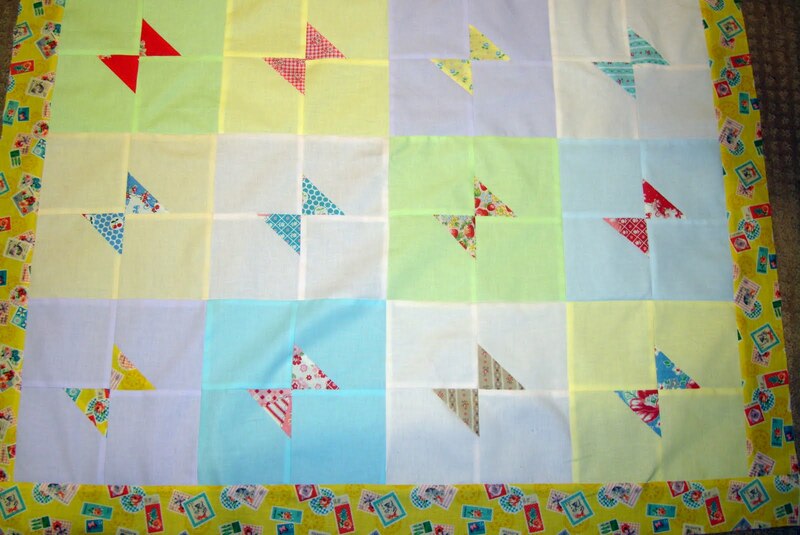 Most recently I used it in a baby quilt that I'm currently binding. 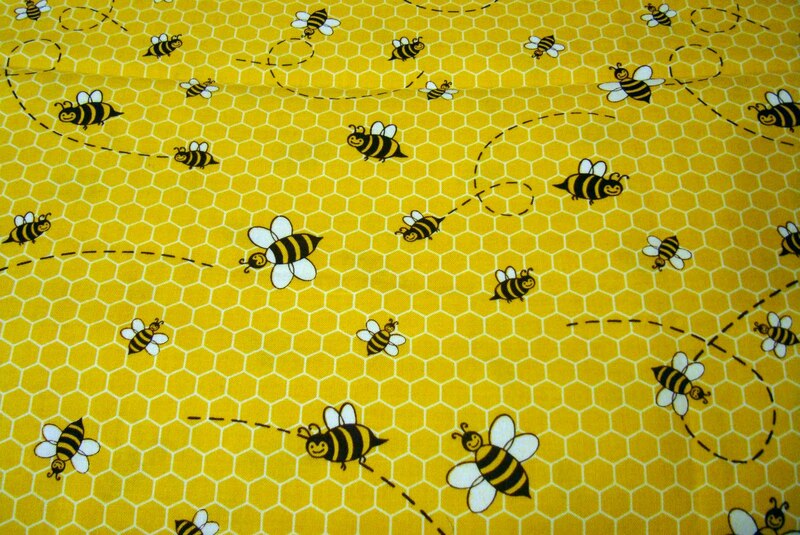 I like everything about this fabric. It makes me feel like I must hoard it because it is hard to find. It has been kind of a crappy week with a summer cold for me. I'm kind of out of it. Hopefully next week will be better. I've recently picked up 4 out of 5 latest quilts from the quilter. And now I'm in the process of binding. 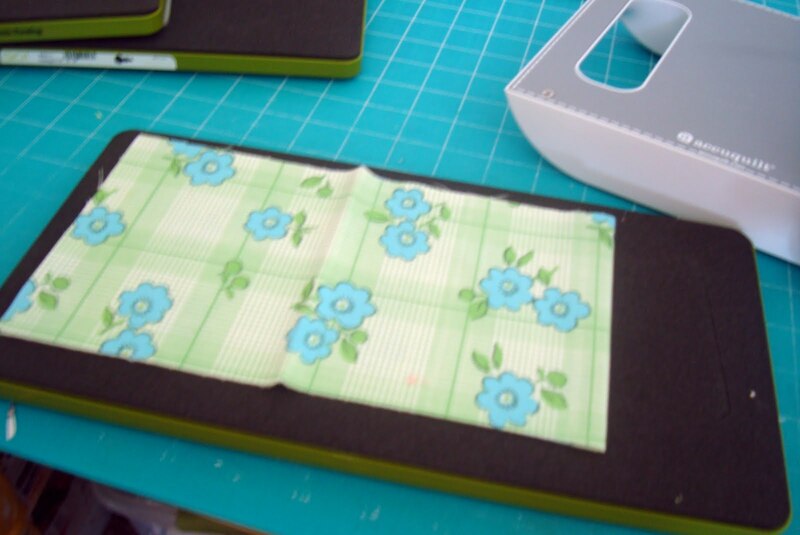 Binding is "in front of the TV work". Good thing too, because I caught a summer cold and that is about all I've felt like doing the past few days. 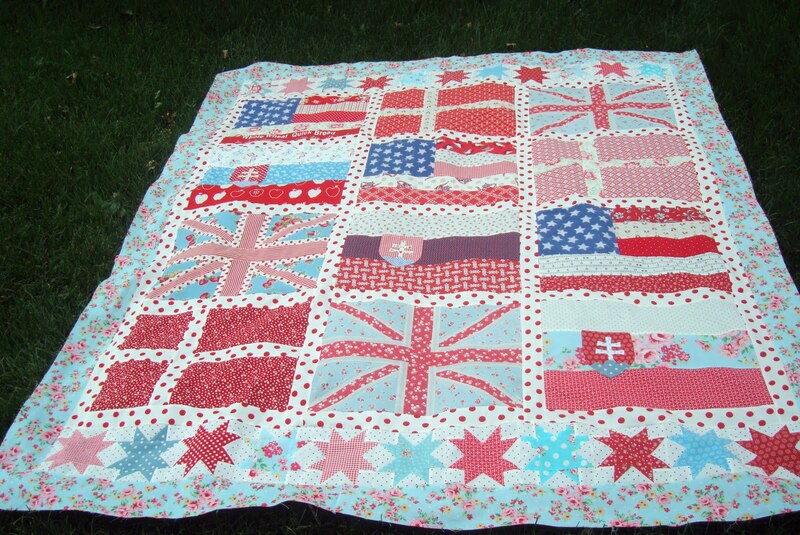 The first quilt I finished binding was my Family History Personal Flag quilt. I had a swirl/star pattern machine quilted into the quilt. Kind of hard to see in photos. I really like how it turned out. 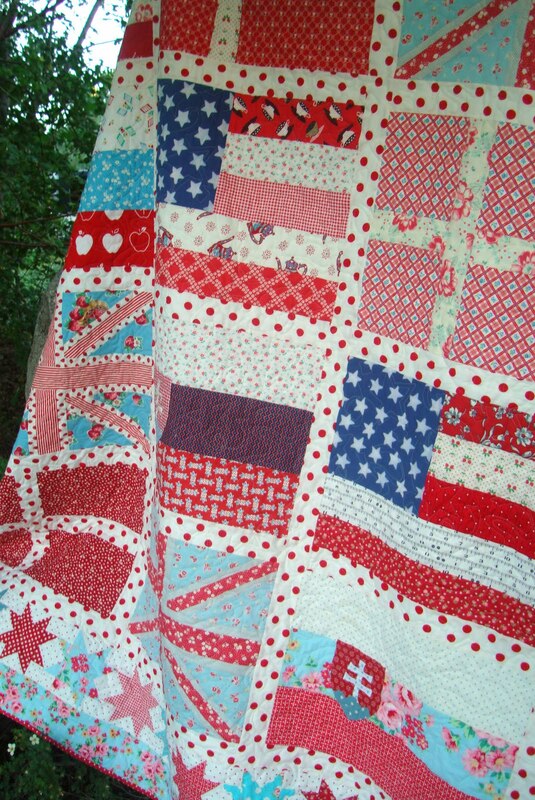 It is a full sized quilt - just big enough to use or to hang. I'm really proud to show off my family heritage. I think my parents would both be really proud of the quilt and to have their parents represented in my quilt. 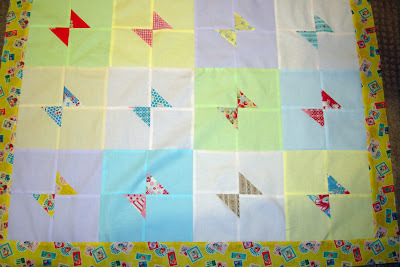 I like the stars in the top and bottom borders, too. 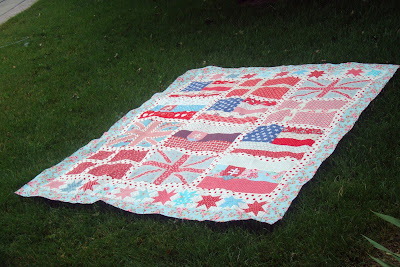 It makes me want to make an entire quilt with red and blue stars. 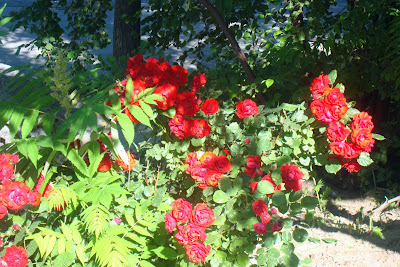 And I like the roses in the blue border. I think it pulls everything together. 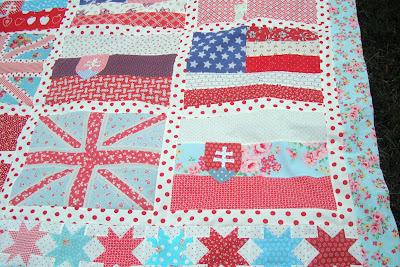 I bound it in a red with smaller white dots, in contrast to the sashing of white with large dots. 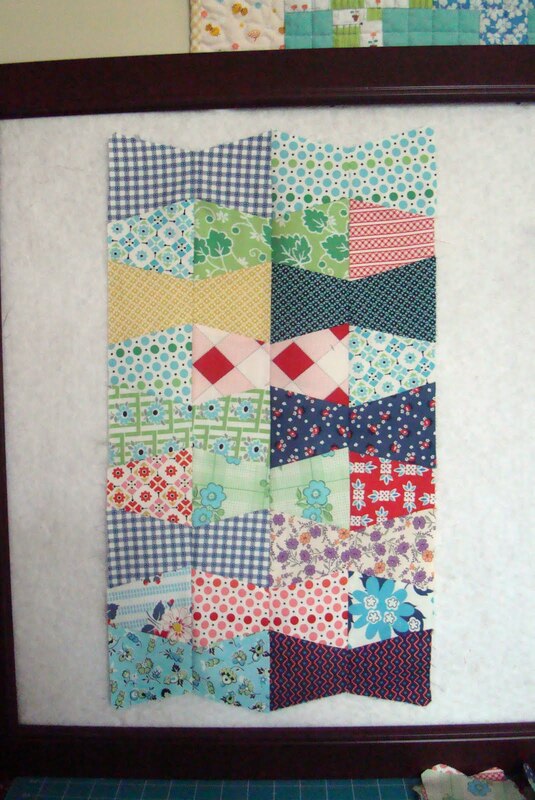 The backing is a blue and white gingham I had on hand. We had a visit with my daughter Chelsey and granddaughter Allison recently (Allison's mom is my daughter Whitney). Chelsey lives in California. And when she comes to Utah we love to have Whitney bring Allison over, too. 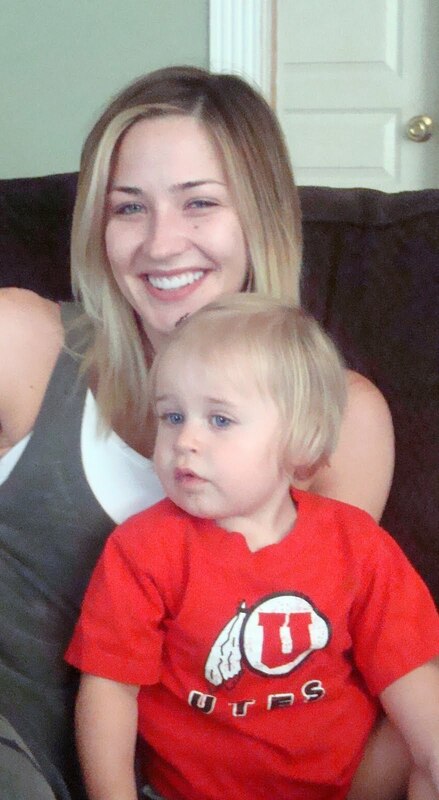 This photo was taken right after Aunt Chelsey cut Allison's hair. It turned out really cute. Hi everyone. Time for a great giveaway. I have been wanting a Go! Baby cutter for a while now and I finally have one. And now it is your chance to get one too. 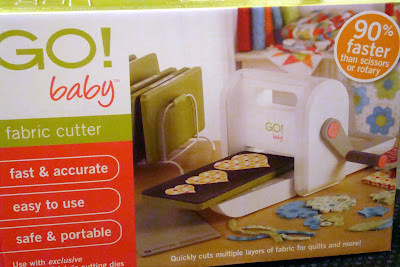 First I'm going to tell you how to enter the giveaway and then I'm going to show you what fun you can have using the Go!Baby. There are just 2 things you have to do to enter the giveaway. 1. You need to visit the AccuQuilt website and register your email to get their free patterns. Hey, free is great. Go HERE now and then come back for the rest of the post. 2. At the end of the post leave me a comment telling me you want to win a Go!Baby and that you have registered for the free patterns to your email address. If you have already registered your email at AccuQuilt previously then just let me know in your comment. Before you leave your comment I want to show you what I've done with my Go!Baby. I have 3 of the Go!Baby Dies. The one I chose to use first is the tumbler. It is so easy to use. 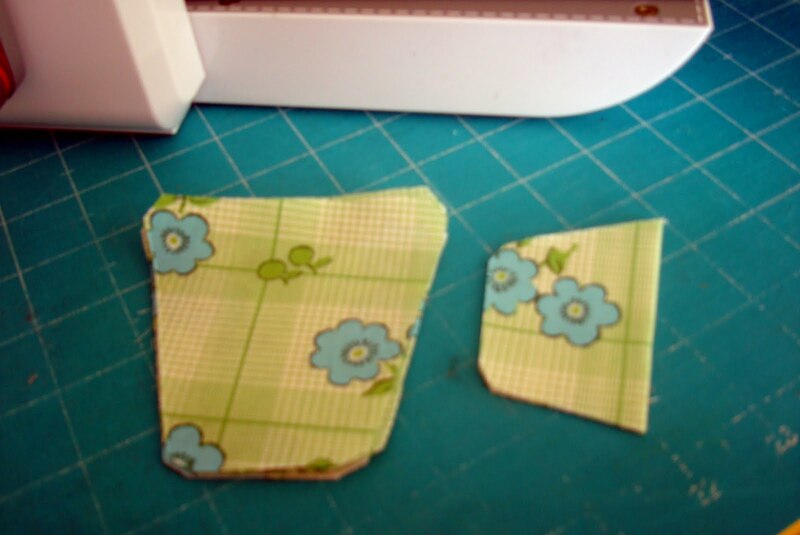 You put your fabric on the bottom die cutting plate and then the plastic cover goes on top of the fabric. 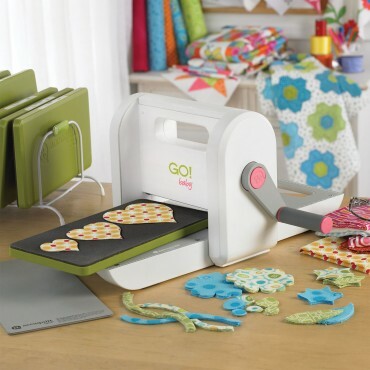 With a short crank of the handle your fabric is cut into your desired shape. 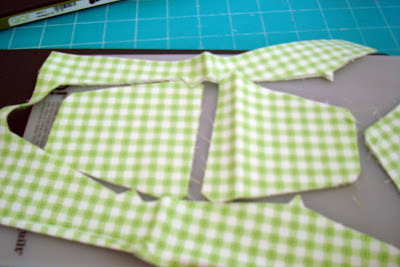 It reminds me of making sugar cookies with the cut out shape and the little bit of left over around it. 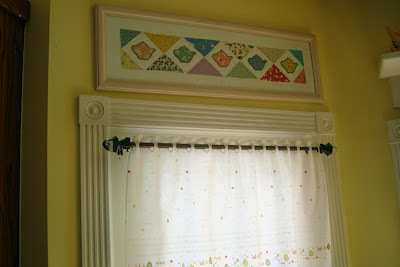 I made the tumbler shapes out of my Joann's Denise Schmidt fabric. 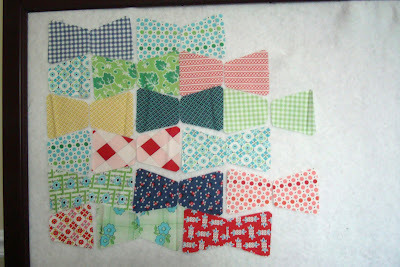 I used my design board to lay out my tumblers into a bow tie pattern. 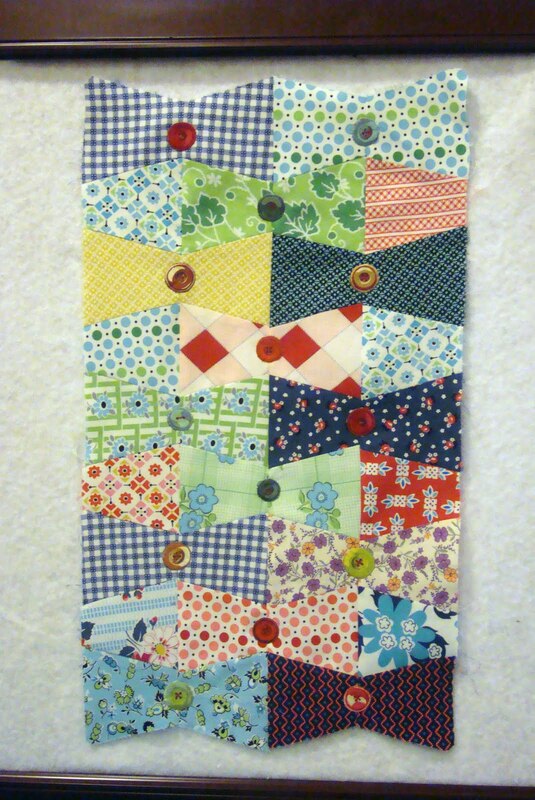 Then I sewed the tumblers into rows vertically. 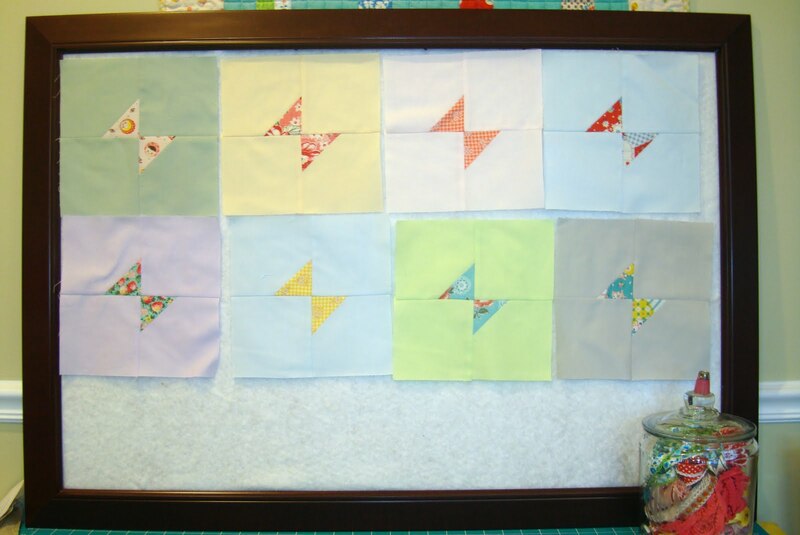 This is my first set of 4 rows. 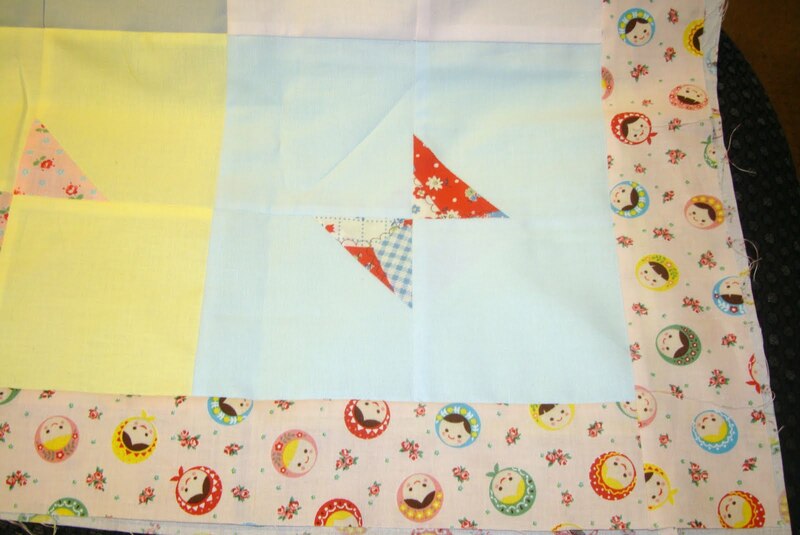 I am not sure yet how big I want to make this project. 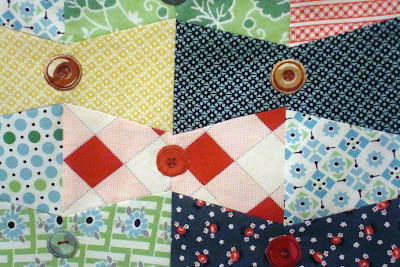 To add some fun to the bow tie pattern I wanted to put buttons in the middle. But I used cheater buttons from fabric. 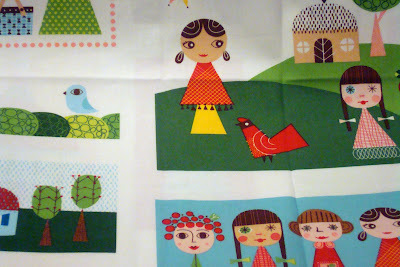 I've been wanting to use this Yuwa fabric by Suzuko Koseki for some time now and this seemed the perfect project. 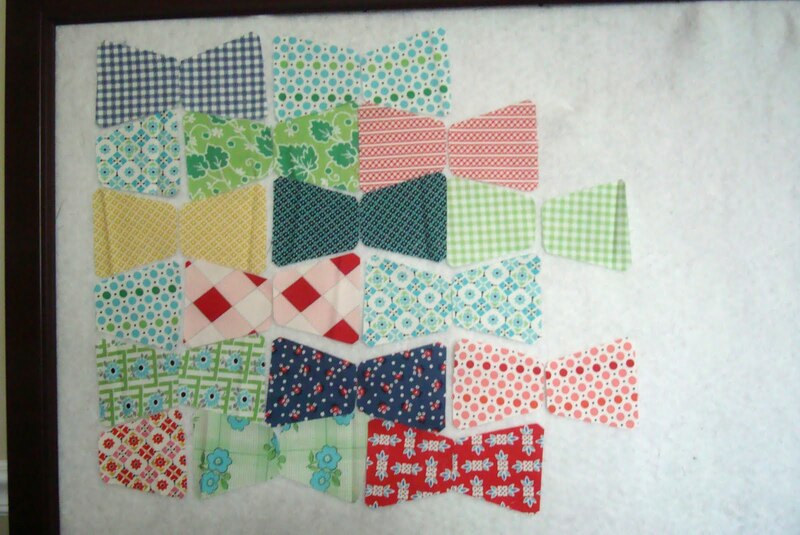 I appliqued the buttons onto the center seam of the tumbler bow ties made with matching fabric. 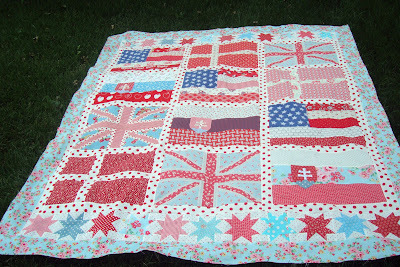 The buttons look so real but if I decide to use this as a baby quilt it will be child safe. I think it turned out really cute. 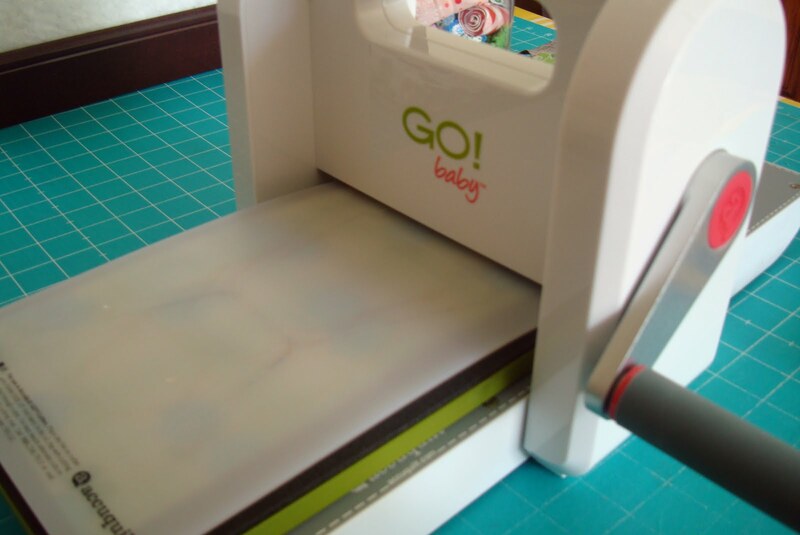 There is so much to do with the Go!Baby. I am excited to use it for upcoming projects. Now leave me a comment telling me you registered for the free patterns through email and that you want to win a Go!Baby. I'll pick a winner with a random number generator on Friday July 22, 2011. Good luck everyone. The giveaway is open to everyone. Check back on Friday. It is Friday but I have no fabric to show today. Instead I thought I would show things inside and outside that inspire me. 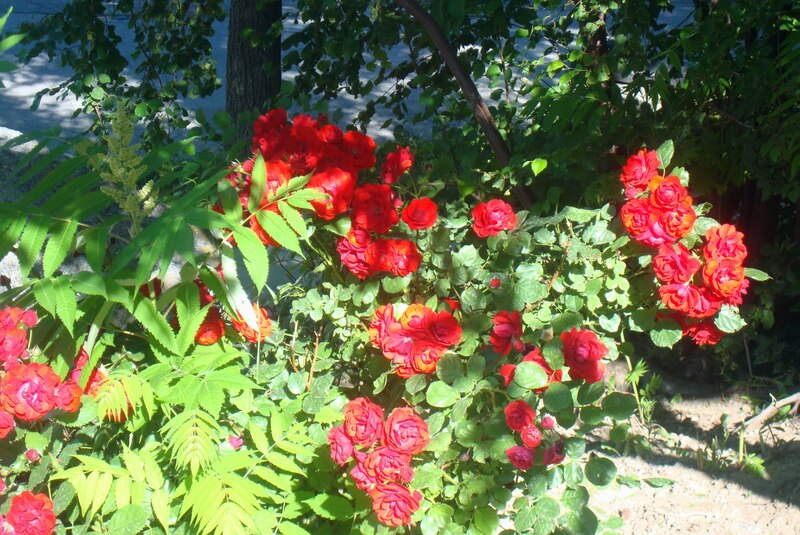 I have red roses in several areas of my yard. I love the color of a red rose. It is so pure. And red is so beautiful, especially set with green. Red and green don't always have to say Christmas. 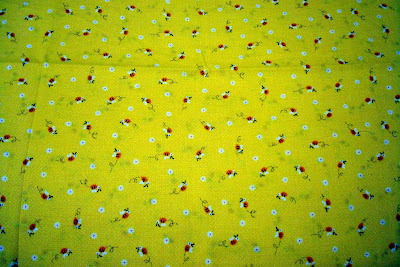 I love fabric with flowers on it. Don't we all? My yard is quite busy, just like my quilts. Lots of untamed growth. 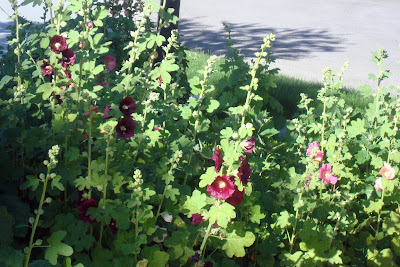 My hollyhocks inspired my post theme today. I really love roses but I love hollyhocks more. 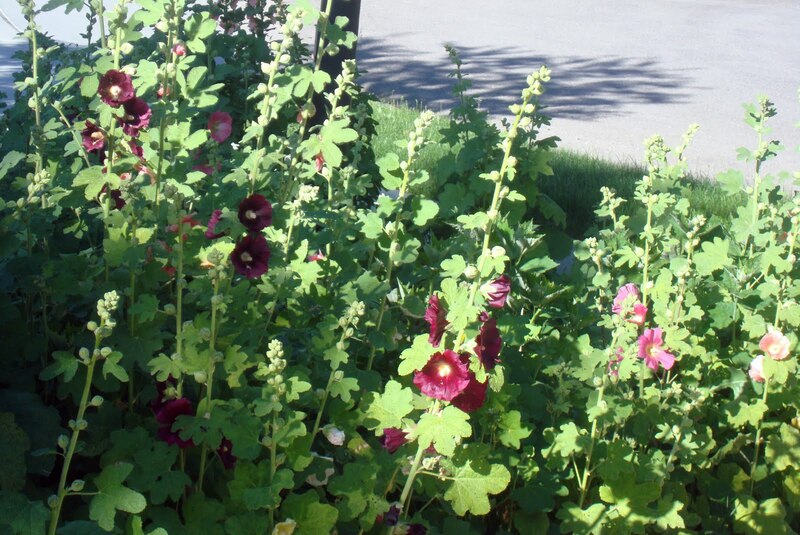 I got my first hollyhock seeds from Jeanette at Piper's Quilts and Comforts in the Salt Lake area. Jeanette has fantastic hollyhocks growing to the side of the shop. 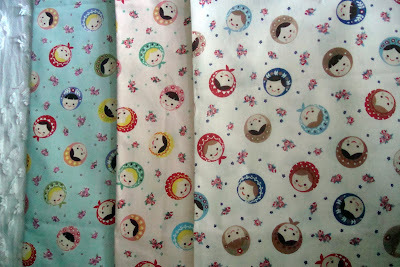 I also got my first Japanese fabric at Piper's. 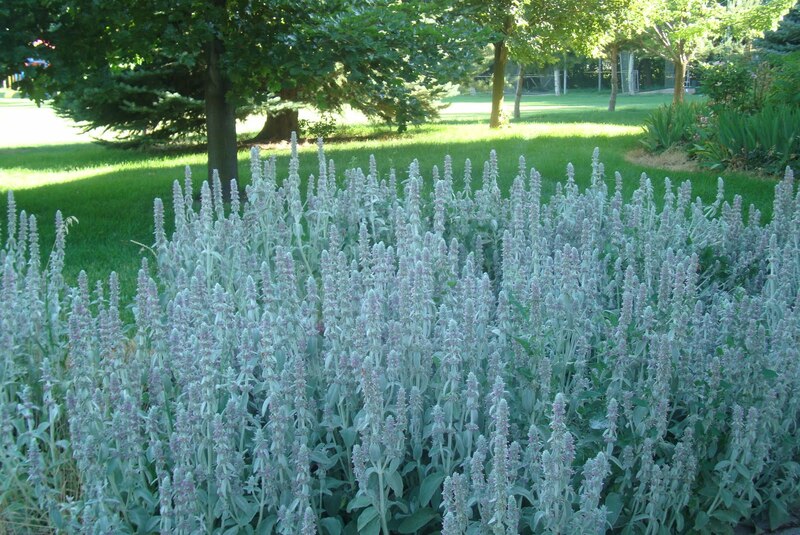 My lamb's ear flowers cover an area of my front walkway. 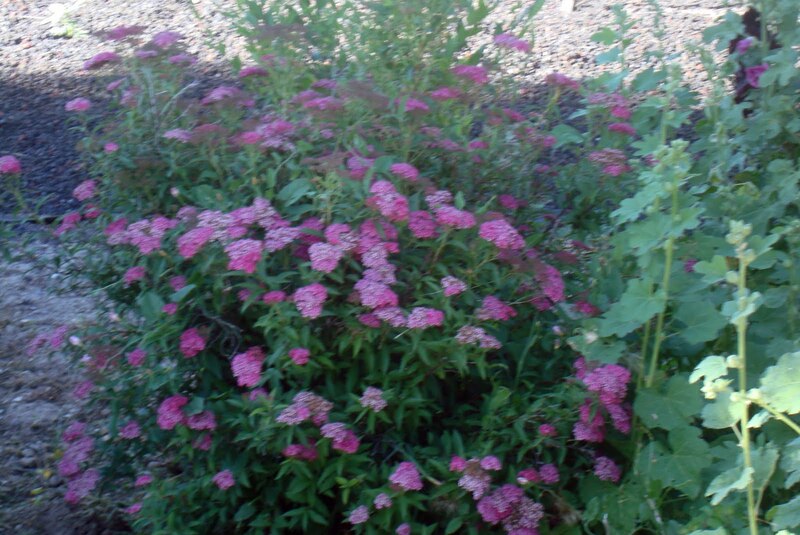 The frosty green stems are not the most beautiful flowers but I knew I had to plant them after a visit to Temple Square in down town Salt Lake City one year. Being a city girl I had never seen this plant before. The temple grounds are inspiring year round but summer is the most beautiful I think. I find the texture of the lamb's ear most inspiring. Things inside my house inspire me, too. I love fabric with jumbo polka dots. Teapots inspire me. I think they are such a beautiful shape. Old buildings inspire me. This photo was taken years ago while on a visit to my roots in Pennsylvania in front of the old Reading Hospital where I was born. My mom (Freda) is with me in front of the building in the photo. 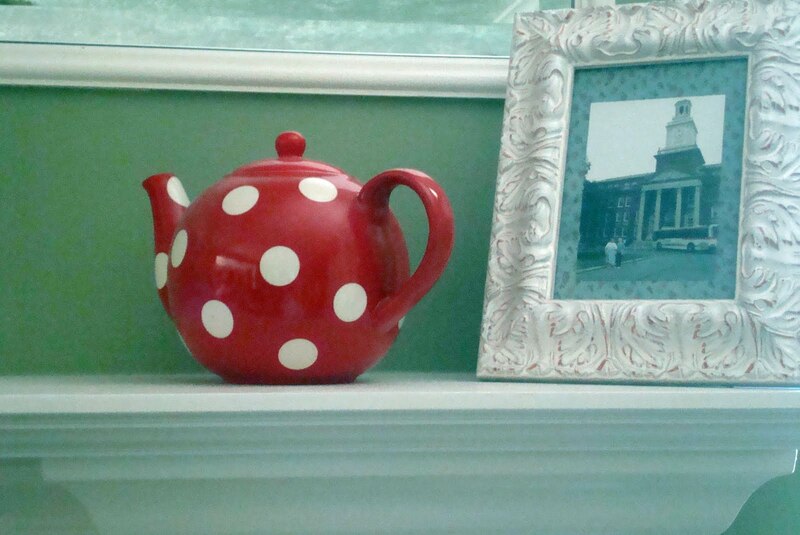 The teapot cross stitch was given to me by my mom probably 20 years ago or more. This vintage kitchen fabric quilt hangs in my kitchen. 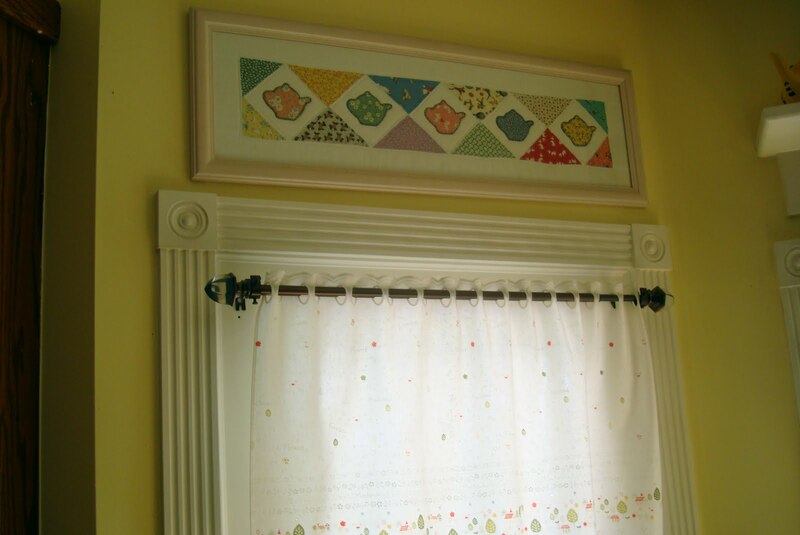 Old kitchen fabric and wallpaper inspire me. Obviously. 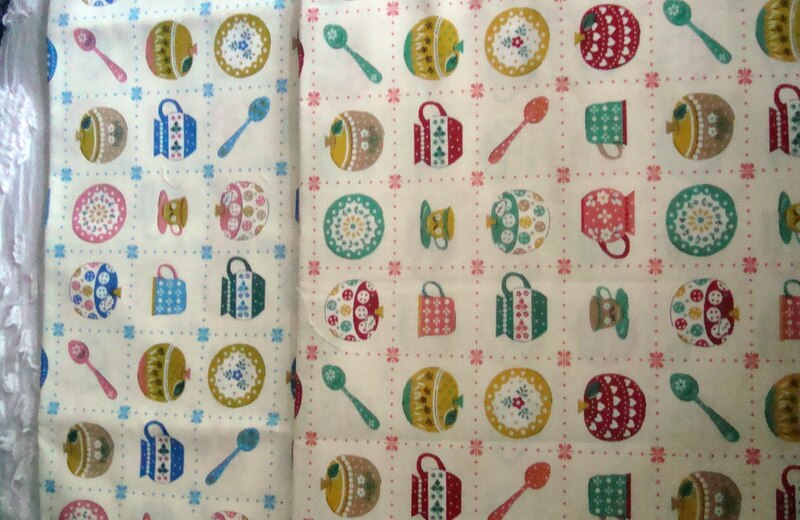 More teapot/teacups. 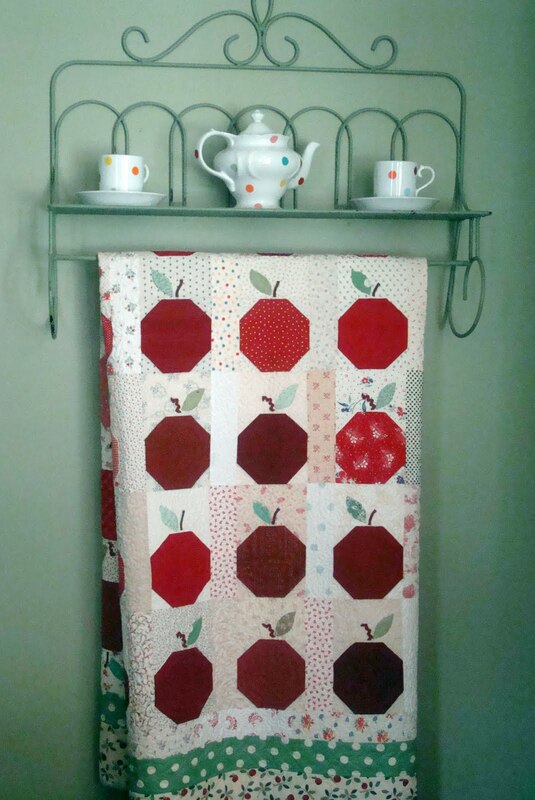 This apple quilt is in my family room. 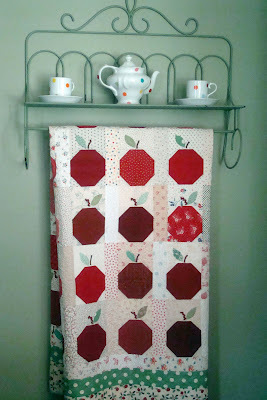 The apples are from a group block exchange we did several years ago in our Alpine Quilt Group. My friends inspire me. 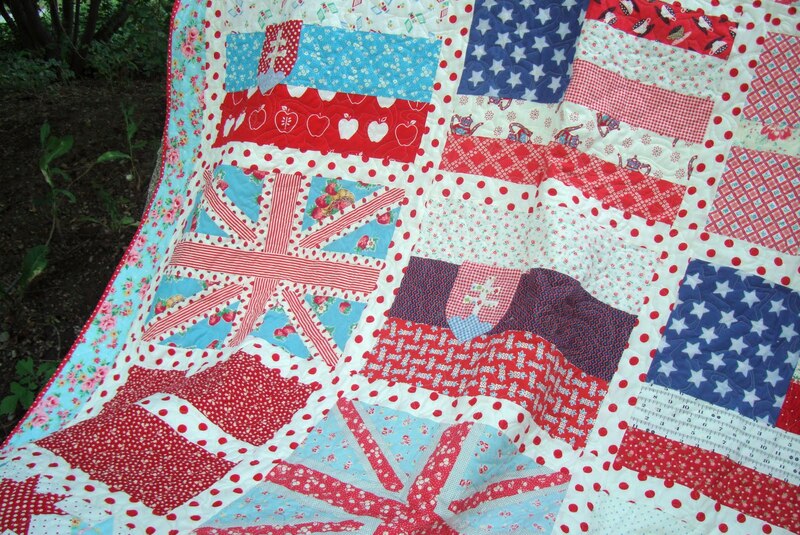 When I look at this quilt it helps me think of the many ways friends inspire me. 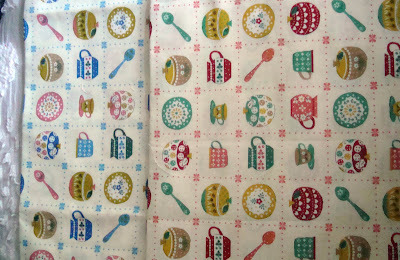 More teapots made with Aunt Grace fabric. 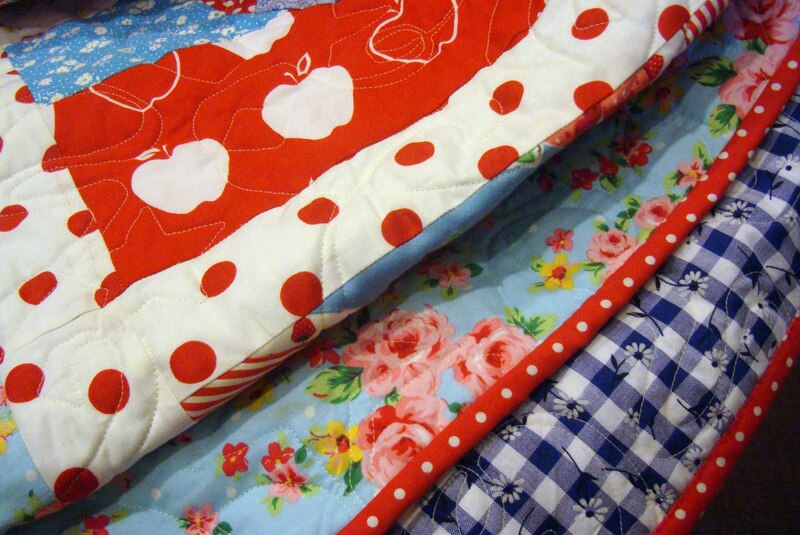 The rebirth of 30's fabric is one of the reasons I started making quilts with abandon. I got these bowls at Amazon. They are new but retro. 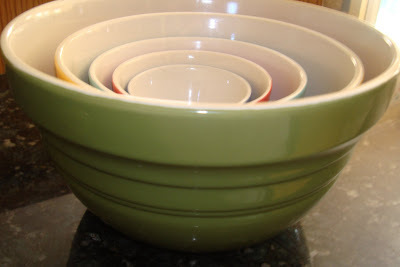 The shape, texture and colors of the bowls inspire me. 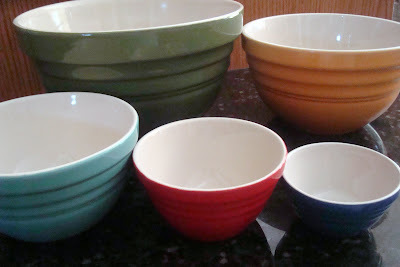 Cheaper than the real vintage bowls, these are microwavable and dishwasher safe. 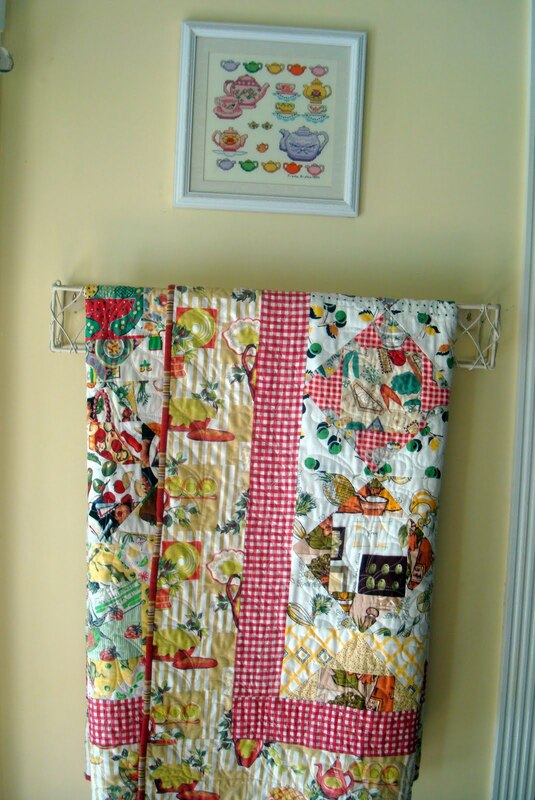 I love to put dishes and kitchen things in my quilts. Have a nice mid summer weekend. Can you believe we are half through July already? I always think of that on July 15 - Mr. Hive's birthday. I say I'm a finisher not to brag (Heavens No!) but to make myself feel like I'm accomplishing something in 2011. I have been on a finish roll this month and I have to tell you it feels really good. I have a difficult time positioning quilt tops for photographing previous to the machine quilting. They are floppy and flimsy (yes, I love that name) and I don't like taking photos of them because of that. 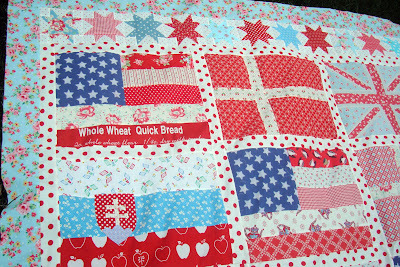 I had my daughter Laurie hold this one up for me but it doesn't do it justice because you really can't see the borders well. 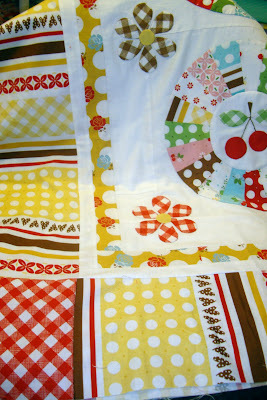 This is my Cherry Cheesecake quilt top made from my Lori Holt pattern. 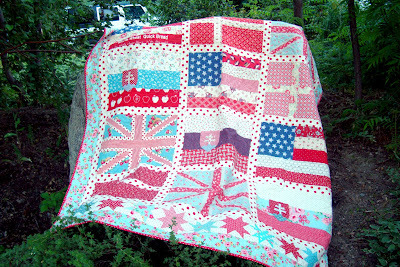 I am so excited to be finished and get it sent off to the quilter. I really like the stripes in Lori's line of fabric so i wanted to use that piece for my outer border. I used the red gingham for the corner pieces and I like how it turned out. I'm going to bind it in the red gingham when I get it home from the quilter. 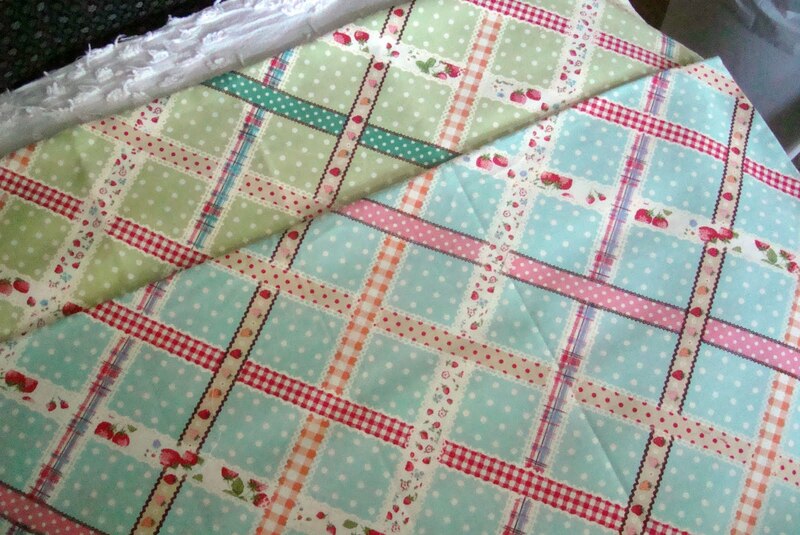 I think the red gingham will make the binding pop. I love this quilt. 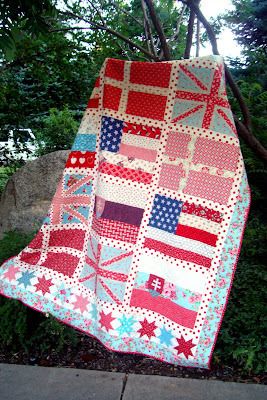 It was a joy to make. 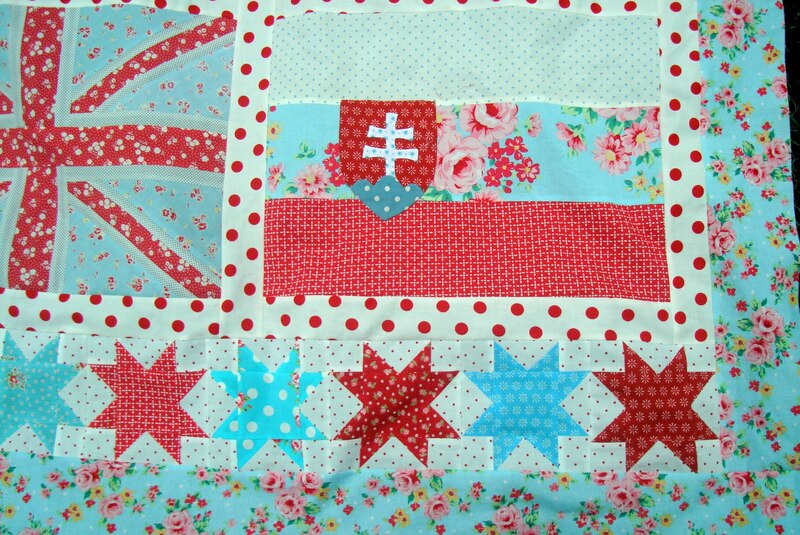 I must say the daisies did take me longer than I thought they would but I adore them. 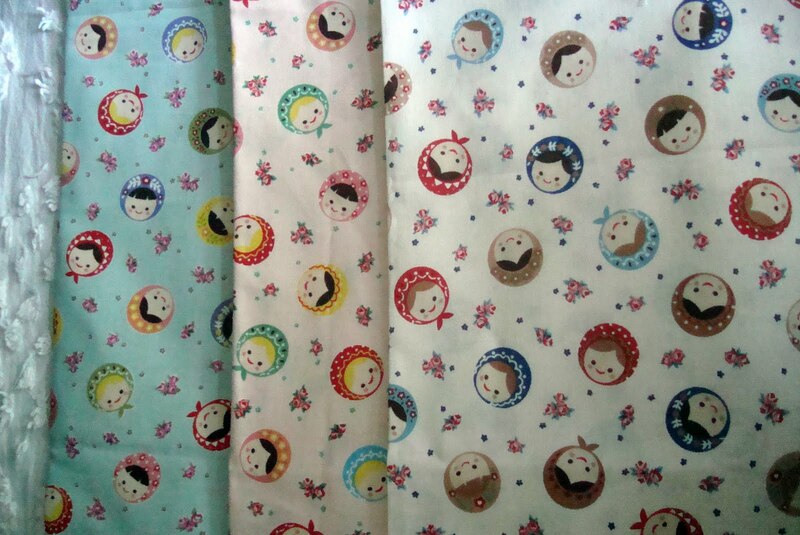 I love novelty fabrics. 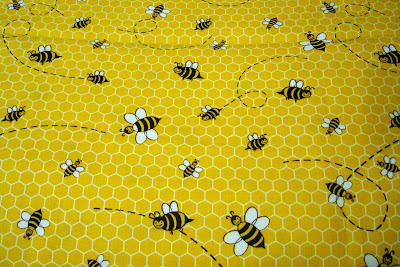 Today is Fabric Friday featuring the birds and the bees. 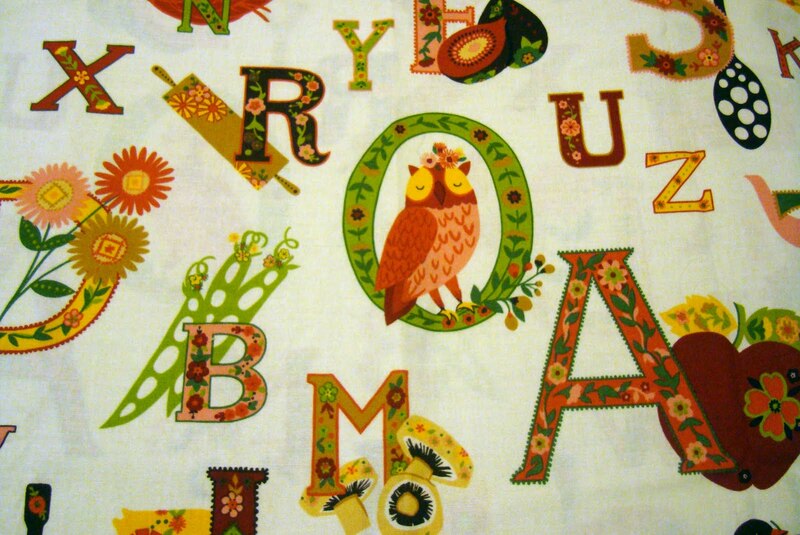 This new retro novelty fabric by Alexander Henry has everything. 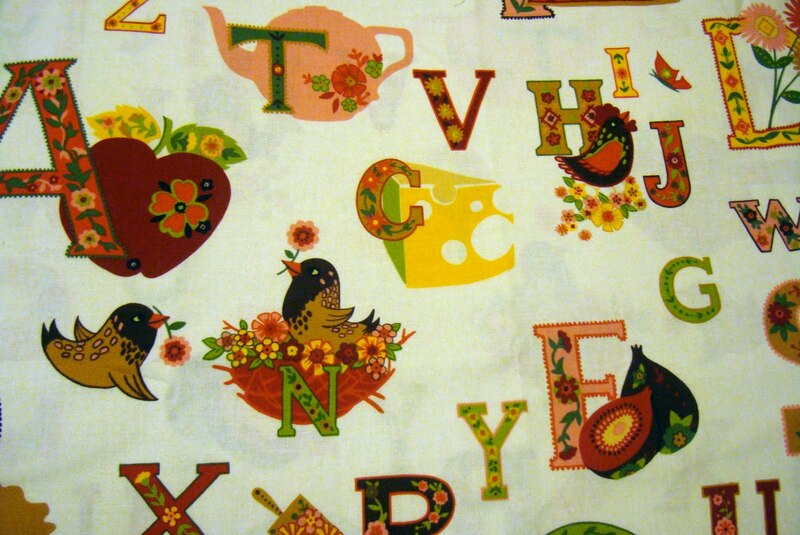 It is kitchen fabric with letters, flowers and birds. The teapot and rolling pin are great. But of course so are the birds. Above is a chicken and 2 nesting birds. The owl is really sweet surrounded by vegetables and fruit. The mushrooms are so 60s - 70s. 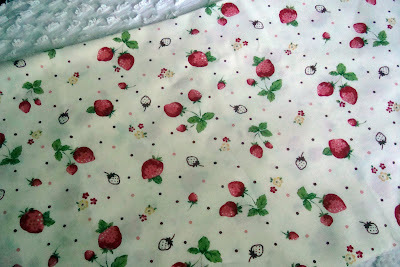 This fabric called Appleville was seen at market by Lori and me while we walked up and down the aisles. We both wanted some but they didn't have it out at market. However, it came out right afterwards. Appleville is really cute. 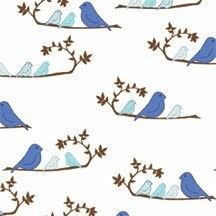 The cardinal and blue birds in it are very sweet. 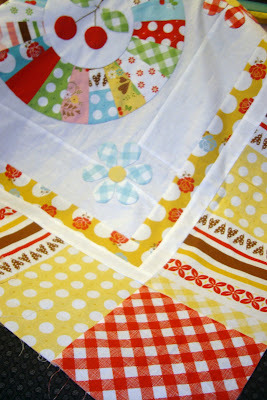 This is a new fabric by Free Spirit and Valorie Wells called Wrenly. This is just an image. I'll pick up a fat quarter when I see it. 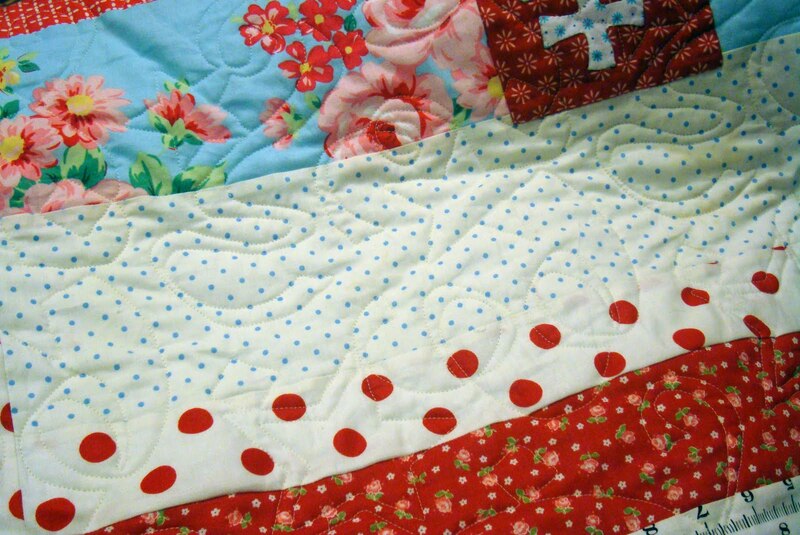 It reminds me of some vintage fabric I have tucked away. 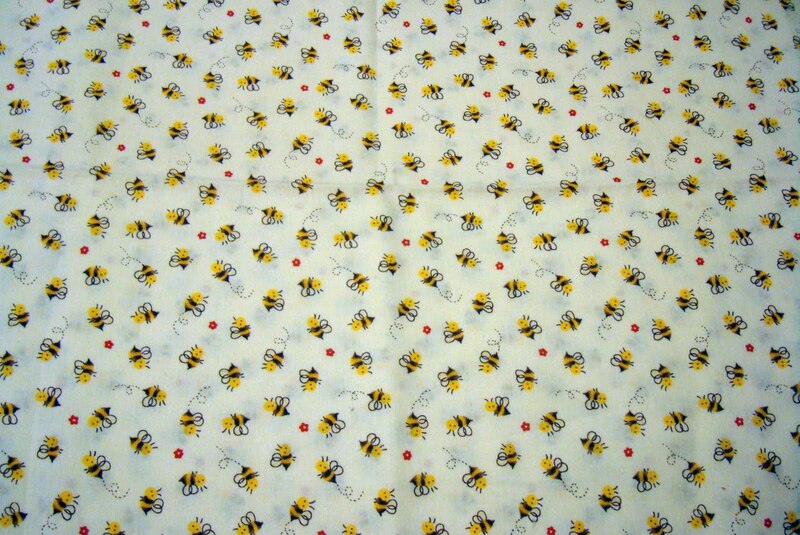 I've been collecting bee fabric for 10+ years now. I have several beehive wall hangings and a full sized beehive quilt. 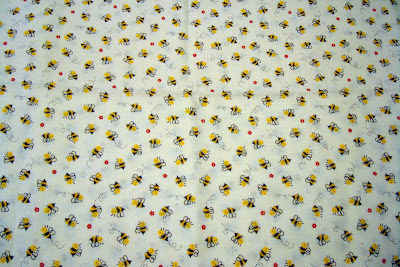 I like to put a bee in my quilts whenever possible too. These bees are very whimsical. More whimsy. I like bees with that novelty flair that aren't very realistic looking but more story book. Look at the cute faces on these bees flying inside and around the honeycomb. 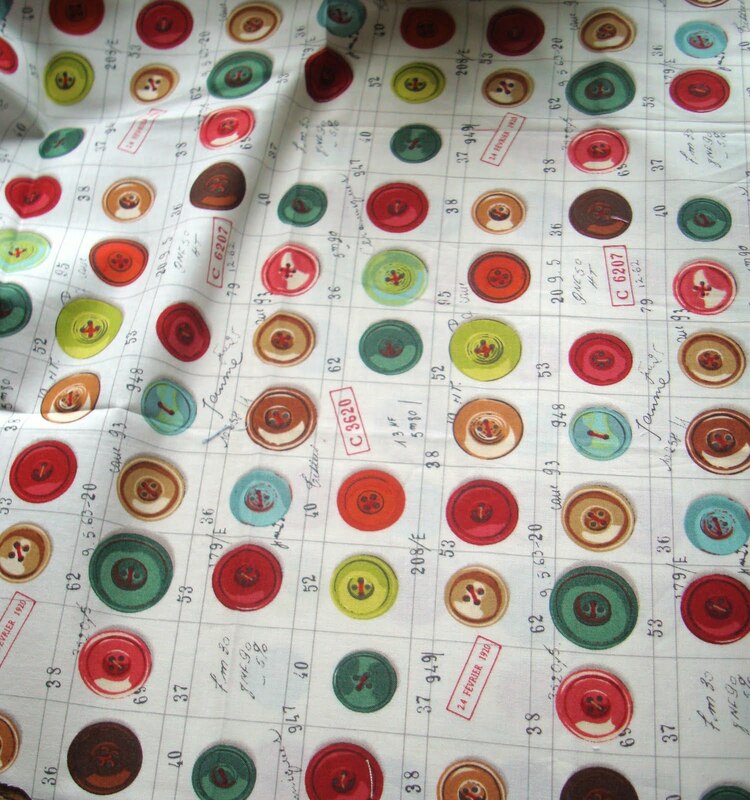 This is one of my favorite fabrics. 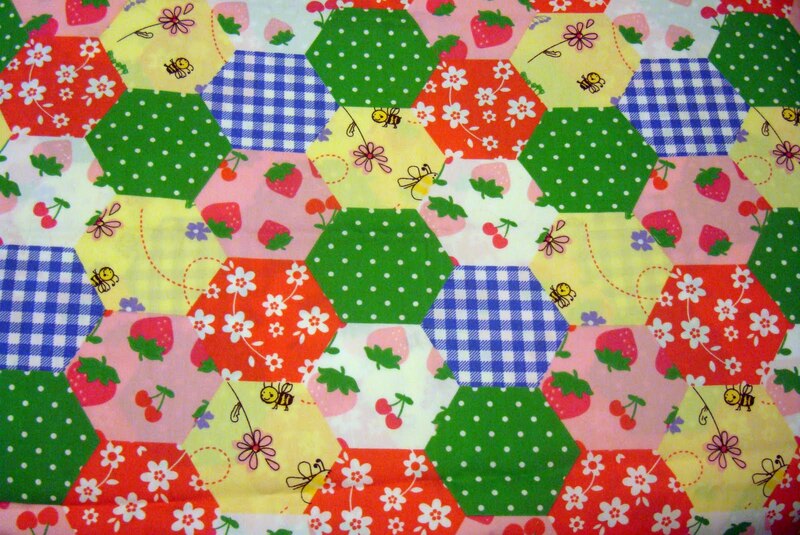 It incorporates some of my fabric likes including strawberries, cherries, gingham, dots, flowers, hexagons and the bees. 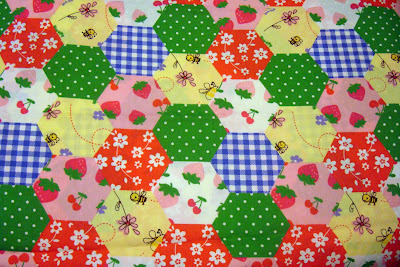 Hexagons are also fun to put in quilts, I think. Happy Weekend everyone. Next week I'll show you my next 2 finished flimsies. 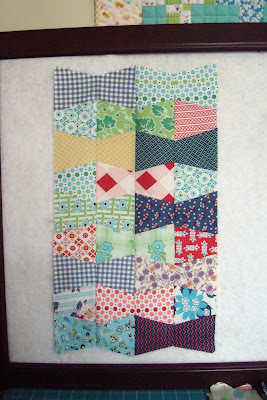 I am working on the backs for the tops and need to press them before delivering to the quilter. 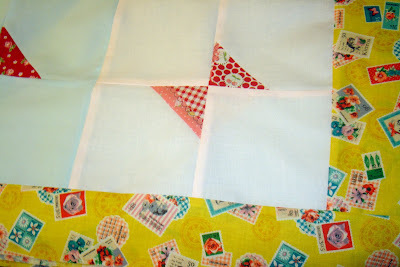 I have my quilting designs all in mind.